Our extensive research has shown that imitating the smart money can generate significant returns for retail investors, which is why we track more than 700 prominent money managers and analyze their quarterly 13F filings. The stocks that are heavily bought by hedge funds historically outperformed the market, though there is no shortage of high profile failures like hedge funds’ recent losses in Facebook. Let’s take a closer look at what the funds we track think about Caesars Entertainment Corporation (NASDAQ:CZR) in this article. Following two quarters of declines, hedge funds were collectively buying back into Caesars Entertainment Corporation (NASDAQ:CZR) during Q3, as there was a 7% increase in the number of hedge fund shareholders. Seth Wunder’s Black-and-White Capital and David Rosen’s Rubric Capital Management were among the funds to go long CZR during Q3. While several funds opened positions in Caesars during the September quarter, it wasn’t quite enough to lift the stock onto our countdown of the 30 Most Popular Stocks Among Hedge Funds, as it landed in 47th place, being owned by 63 of the funds tracked by Insider Monkey. Today there are plenty of methods market participants put to use to grade publicly traded companies. Some of the less utilized methods are hedge fund and insider trading indicators. Our researchers have shown that, historically, those who follow the top picks of the best money managers can trounce the market by a superb amount (see the details here). What does the smart money think about Caesars Entertainment Corporation (NASDAQ:CZR)? At Q3’s end, a total of 62 of the hedge funds tracked by Insider Monkey held long positions in this stock, an increase of 7% from the second quarter of 2018. 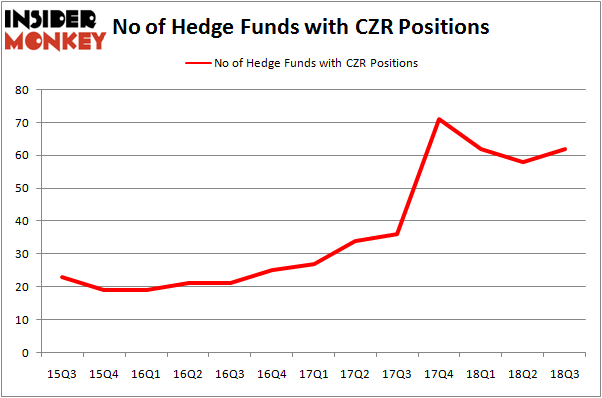 By comparison, 71 hedge funds held shares or bullish call options in CZR heading into this year. With the smart money’s positions undergoing their usual ebb and flow, there exists an “upper tier” of notable hedge fund managers who were boosting their stakes meaningfully (or already accumulated large positions). 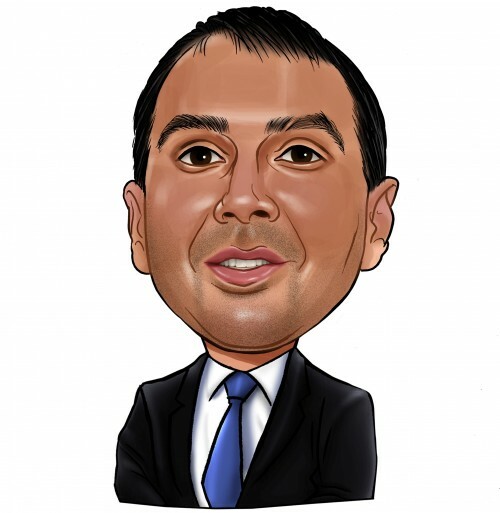 Of the funds tracked by Insider Monkey, Canyon Capital Advisors, managed by Joshua Friedman and Mitchell Julis, holds the biggest position in Caesars Entertainment Corporation (NASDAQ:CZR). Canyon Capital Advisors has a $695.7 million position in the stock, comprising 9.5% of its 13F portfolio. Sitting at the No. 2 spot is Senator Investment Group, managed by Doug Silverman and Alexander Klabin, which holds a $451 million position; 5.8% of its 13F portfolio is allocated to the company. Some other professional money managers with similar optimism encompass Parag Vora’s HG Vora Capital Management, George Soros’ Soros Fund Management and Edward A. Mule’s Silver Point Capital. Now, key hedge funds have jumped into Caesars Entertainment Corporation (NASDAQ:CZR) headfirst. Gates Capital Management, managed by Jeffrey Gates, assembled the most outsized position in Caesars Entertainment Corporation (NASDAQ:CZR). Gates Capital Management had $68.8 million invested in the company at the end of the quarter. Michael Weinstock’s Monarch Alternative Capital also made a $51.3 million investment in the stock during the quarter. The other funds with brand new CZR positions are Roberto Mignone’s Bridger Management and Steve Cohen’s Point72 Asset Management. Let’s check out hedge fund activity in other stocks – not necessarily in the same industry as Caesars Entertainment Corporation (NASDAQ:CZR) but similarly valued. We will take a look at China Southern Airlines Company Limited (NYSE:ZNH), Bright Horizons Family Solutions Inc. (NYSE:BFAM), Forest City Realty Trust, Inc. (NYSE:FCE), and Allison Transmission Holdings, Inc. (NYSE:ALSN). All of these stocks’ market caps are closest to CZR’s market cap. As you can see these stocks had an average of 20 hedge funds with bullish positions and the average amount invested in these stocks was $904 million. That figure was $4.32 billion in CZR’s case. Forest City Realty Trust, Inc. (NYSE:FCE) is the most popular stock in this table. On the other hand China Southern Airlines Company Limited (NYSE:ZNH) is the least popular one with only 5 bullish hedge fund positions. Compared to these stocks Caesars Entertainment Corporation (NASDAQ:CZR) is more popular among hedge funds. Considering that hedge funds are fond of this stock in relation to its market cap peers, it may be a good idea to analyze it in detail and potentially include it in your portfolio. Billionaire Ken Fisher is Betting Big on this Japanese Banking Giant Hedge Funds Are Underwhelmed by Sanofi (SNY)’s Growth Prospects Is Old Dominion Freight Line, Inc. (NASDAQ:ODFL) A Good Stock To Buy? Hedge Funds Are Dumping C.H. Robinson Worldwide, Inc. (NASDAQ:CHRW) Is It Time to Follow Hedge Funds Into BP p.l.c. (BP)? Is Ulta Beauty, Inc. (NASDAQ:ULTA) A Good Stock To Buy?